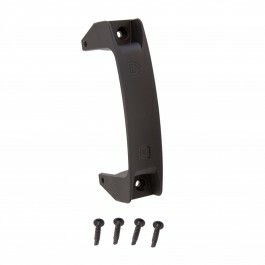 This gate handle is a general-purpose device designed to fit all types of gates and gate materials. Features strong polymer construction and modern ergonomic design. This gate handle is a general-purpose device designed to fit all types of gates and gate materials. It offers convenient gate opening and closing on virtually all commercial and household applications. Our handle features strong polymer construction, modern ergonomic design, and is guaranteed against rusting and staining. Fits left-hand and right-hand opening gates for your convenience.